The extended wheel base ghost is 7 inches longer than the regular ghost and is the ideal vehicle to be chauffeured in. Although a little smaller than the Phantom, the Rolls Royce Ghost still has the V12 to carry you from 0 to 60 in 4.7 seconds. Not your run of the mill V12 either, it’s a 6.6 liter twin-turbocharged, direct injected engine that cranks out an impressive 563 horses. That’s 110 horse power more than the Phantom. The power and exhilaration of a sports car in a stylish, high class, panache body that Rolls Royce is known for. Be revered for your flair, style, refinement and of course your wealth when you are chauffeured in your Roll Royce Phantom Ghost. (We can provide the hired driver also). 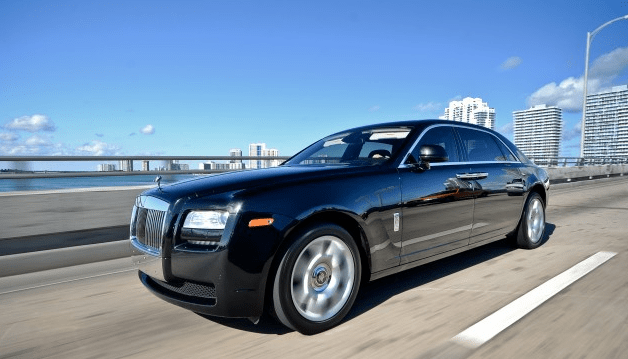 Renting a Roll Royce Ghost is Simple. Let Us Help. In a class where 455 ft-lbs is the norm, torque is quite substantial, at 575 ft-lbs.